Many Veddah elders, such as Kiri Banda of Dambana, are keen to preserve the age-old Veddah way of life for generations to come. Like father, like son. 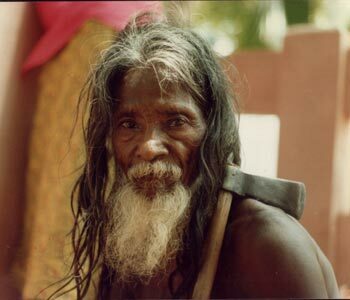 Sri Lanka's Waniyalaeto still cherish their age old indigenous lore and life style. Sri Lanka's indigenous Veddas, or Wanniya laeto (forest dwellers) are often portrayed as shy half savages of the jungle -- and yet visitors to their remote hamlets are often surprised and humbled by the rustic nobility of their 'primitive' hosts. No doubt, the shy nature of the Wanniya-laeto has served to insulate them from outside world for thousands of years. Even today, many still converse in their own archaic language, preserving ancient wisdom and traditions of indigenous knowledge that is as old as humanity. With the declaration of 1993-2003 as the International Decade for the World's IndigenousPeople and the advent of eco tourism, visitors in growing numbers are keen to meet indigenous people face to face. Those who do venture to visit the Wanniya laeto, however, should be aware of some principles of courtesy common to most traditional cultures, including the Wanniya-laeto.By observing them, visitors also participate in age old rituals of courtesy that are expressive of indigenous wisdom. Visitors: Men, women and children alike should dress in modest attire when meeting traditional villagers, and the Wanniya-laeto, no matter how casual their attire may seem. There are no exceptions. Women in particular should dress as modestly as their village counterparts. 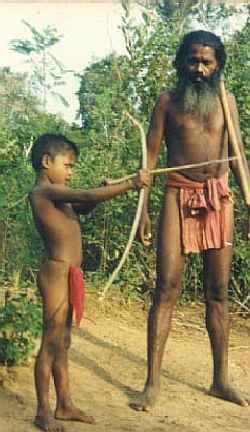 Wanniya-laeto men typically go bare bodied above the waist, but many also feel undressed without their jungle axe, the mark of Wanniya-laeto identity. As a matter of courtesy visitors should leave vehicles (and footwear) some distance from Wanniya-laeto homes and approach slowly on foot. Normally, a male elder will come forward to greet visitors by offering both hands in a firm double handshake with direct eye contact. This indigenous rite of greeting (and departing) that bridges all differences while affirming the unique dignity of every human being. Don't be discouraged if you do not speak the language -- the Wanniyalaeto themselves often do not understood each other perfectly. But the language of intention full of good humor, with facial gestures and hand language, is universally understood. Men folk may hold hands while speaking as a mark of friendship, and hugging is also permissible between friends. Often, when the guest has come from afar to a remote settlement, the host may invite or insist that one remain for the night. However poor the household is they will offer guest their best food, occasionally venison and honey. Too often, modem visitors take home much and offer little in return. Like other people, Wanniyalaeto, too like to have their photos taken, but they have learned that visitors seldom trouble to share a copy with them. By ancient tradition, Sri Lanka's 'first people' are entitled to demand tribute from anyone who draws upon their indigenous heritage. So, if you do share your photographs with your Wanniyalaeto subjects, be prepared to acknowledge their traditional status by offering fair payment for your valued photographs, especially when they have helped you to take such memorable photos. By respecting indigenous people's customs and beliefs sincerely, visitors open themselves to heartfelt communication through the "wink language" of ingiya, the international 'language of the eyes'. Visitors may suddenly discover themselves in a long lost world where violence is confined to hunting and truth in speech is the cultural norm. 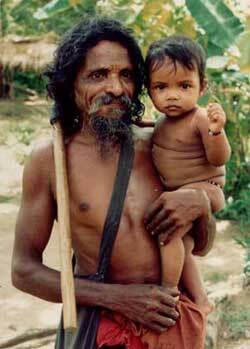 The more one deals with indigenous people of Sri Lanka, the more one admires them. Their gentle, uncontrived lifestyle is sure evidence of a mature culture far more ancient than any other in Sri Lanka, marked by a strong sense of justice and personal dignity. Wanniya-laeto speak little, but they speak the truth. Rarely do they quarrel, and they are faithful in love to a degree that is scarcely equaled in today's world. With their mature cultural heritage, it is not surprising that Sri Lanka's indigenous communities are so keen to avert cultural extinction in the pell mell rush to modernize. Modern tourists need not undermine indigenous customs and values. Instead, with a smile and a heartfelt handshake, they may visit and return home with a better understanding of how people once lived together in peace in this resplendent island paradise.